From time to time most of us find ourselves in situations that we really don’t understand. When things outside our control seem to take off with a life of their own and before we know it we are reeling from the after effects. I have been in that situation more than once and initially want to react out of fear. But as followers of Christ, God has NOT given us the spirit of fear, but of power, love and a sound mind! 2 Timothy 1:7 I don’t quote this to make light of any difficult time you may be encountering but to get you back to the reality of who God is and what His Word ensures us. Without any trials, testing or difficult times, we never really get to see just how faithful and true God’s Word is. It can be depended upon in every situation. There are no surprises to God. Though we don’t understand why some of the challenges in life come our way, we can trust that He knows the beginning from the end and is not intimidated or stressed by our difficulties. He longs for us to bring our needs before Him and then do something that does not come natural…TRUST HIM. As we read in Romans 8:28 NIV8 And we know that in all things God works for the good of those who love him, who have been called according to his purpose. Not in some or the odd one but in ALL things. Though we most often don’t understand what the purpose is for our difficult times, we still have no reason to fear. His ways are far above our ways. So when we find ourselves in one of these situations the first thing we must do is seek Him and ask for His help. James 5:16 NIV 16 Therefore confess your sins to each other and pray for each other so that you may be healed. The prayer of a righteous person is powerful and effective. Prayer is the most powerful tool God has given us! Use it without hesitation. If God does not bring instant relief from our circumstances, we need to wait on Him and trust Him while we wait. Often the most growth happens during the waiting and trusting period. It is when we learn to trust our God with abandon! Proverbs 3:5,6 NIV 5 Trust in the Lord with all your heart and lean not on your own understanding; 6 in all your ways submit to him, and he will make your paths straight. 2 Corinthians 4:8-18 NIV8 We are hard pressed on every side, but not crushed; perplexed, but not in despair; 9 persecuted, but not abandoned; struck down, but not destroyed. 10 We always carry around in our body the death of Jesus, so that the life of Jesus may also be revealed in our body. 11 For we who are alive are always being given over to death for Jesus’ sake, so that his life may also be revealed in our mortal body. 12 So then, death is at work in us, but life is at work in you.13 It is written: “I believed; therefore I have spoken.” Since we have that same spirit of faith, we also believe and therefore speak, 14 because we know that the one who raised the Lord Jesus from the dead will also raise us with Jesus and present us with you to himself. 15 All this is for your benefit, so that the grace that is reaching more and more people may cause thanksgiving to overflow to the glory of God.16 Therefore we do not lose heart. Though outwardly we are wasting away, yet inwardly we are being renewed day by day. 17 For our light and momentary troubles are achieving for us an eternal glory that far outweighs them all. 18 So we fix our eyes not on what is seen, but on what is unseen, since what is seen is temporary, but what is unseen is eternal. and finally one of my favorite verses…. An excerpt from That The World May Know’s Early Church Discovery Guide. A short time after Jesus the Messiah ascended to heaven from the Mount of Olives, his disciples started to proclaim his message to the world. They began in the familiar lands of Galilee and Israel. Then they pressed on to the far reaches of their world – even to Asia Minor (present-day Turkey), the most pagan and immoral province in the Roman Empire. What gave Jesus’ disciples the passion to endure hardship and persecution in order to share his message in places God-fearing Jews from Galilee preferred to avoid? What inspired them to go where they had nothing to gain for their efforts – indeed, where they had everything to lose, even life itself? How had Jesus prepared them to live out his teachings in daily life and proclaim them so boldly? Like other rabbis of his day, Jesus interpreted the Torah and taught people to apply its teachings so that they could learn how to obey God. But a rabbi was more than a teacher; a rabbi was a living example of how to live life in the way God intended. So a Jewish disciple (talmid in Hebrew) desired not only to learn what the rabbi knew but to act as he acted and to take on the godly character he possessed. As talmidim, Jesus’ disciples had a passionate commitment to be like Jesus in every way possible. They not only taught his interpretation of the Torah, they demonstrated to others how to obey God and live in a way that honored him. Wherever they went, they followed Jesus’ example and taught in word pictures, using concrete illustrations of familiar objects that helped their listeners understand the message of the kingdom of God. In stark contrast to the disciples of Greek teachers who were trained to stand alone and be self-sufficient in their own knowledge, Jesus’ disciples established nurturing communities of believers who supported, encouraged, and – when necessary – corrected one another as they sought to obey God and live out their faith. The message Jesus gave his disciples to share was also fueled by their passion and commitment. Just days before his crucifixion, Jesus took his disciples to Caesarea Philippi, a stronghold of pagan worship located at the foot of Mount Hermon. Here, a river of spring-fed water rushed out from the deep cave at the base of a rock cliff more than one hundred feet high. This cave, called “the gates of Hades”, was believed to be the entrance to the underworld from which the goat-god Pan returned annually to bring fertility to the earth. In this seemingly strange location, Jesus had three key lessons for his disciples. The first had to do with their answer to Jesus’ question, “Who am I?”. Jesus knew his disciples would soon go into places where people worshiped Roman emperors and numerous pagan gods. They would need to remember with certainty that Jesus was the living Messiah. The second lesson had to do with the “gates of Hades” and the shrines built into the rock cliff at Caesarea Philippi. This pagan worship center represented everything that was disgusting and wrong with the world, yet Jesus wanted his disciples to build his church on top of that rock. He wanted them to replace the pagan values of the culture with his values. In order to do that, his disciples needed to know that nothing they’d encounter in Asia Minor or anywhere else – even the “gates of Hades” itself – could stand against his power. The third lesson had to do with Jesus’ challenge to follow him. He challenged his disciples and the pagan crowd to give up trying to gain meaning, purpose, significance, and value from life and instead to give their lives to other people as he would. He challenged them to never be ashamed of him or his words. Jesus’ boldness in teaching them while they were surrounded by pagan worshipers in Caesarea Philippi must have given the disciples courage when they later spoke to hostile kings, priests, and Gentiles in palaces, temples, theaters, and arenas. After his resurrection, Jesus took his disciples to the Mount of Olives for a final lesson. He commanded them to be his witnesses “in Jerusalem, and in all Judea, and Samaria, and to the ends of the earth.” Then, he raised his hands to bless them and ascended to heaven while they watched. Within a few years, the Roman emperors’ claims to divinity would erupt into widespread emperor worship. But Jesus’ disciples had actually witnessed the Son of God – the King of kings and the Lord of lords – ascending to heaven to sit at his Father’s right hand. They could travel the world and testify with confidence that Jesus, indeed, was the living Son of God. 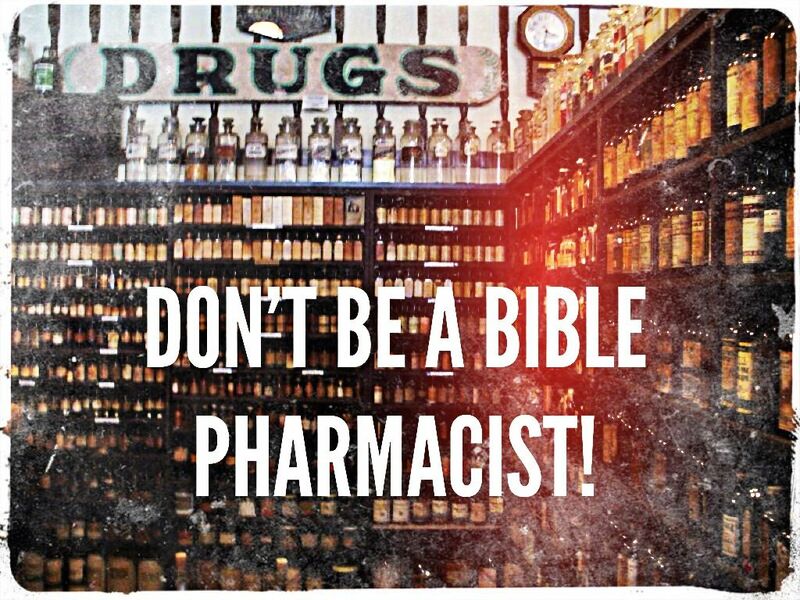 Don’t Be A Bible Pharmacist Be A Bible Doctor! There are two ways to get medicine. The first is from a pharmacist. I call in my prescription, the pharmacist counts out the pills, places them in a bottle, and hands the bottle to me, no questions asked. Pharmacists rarely ask about symptoms, medical history, or current medications. It’s not their job. To put it simply (and I’m sure this is oversimplifying), they fill prescriptions. The second way to get medicine is to go to a doctor. Going to a doctor is a vastly different experience. A good doctor asks me questions about my symptoms. He explores my past medical history. He asks me what medicines I’ve taken in the past. He asks about the medical history of my family members. He feels my limbs and muscles. A good doctor spends a significant amount of time listening before he actually dispenses any medicine. Too often I’m a Bible pharmacist when I should be a Bible doctor. A friend comes to me and tells me he’s having trouble trusting God. I turn to my Bible dispensary, pull out my Romans 8:28 pill, and tell him to take it twice daily for three weeks. That should take care of all the symptoms. Very few questions, very little dialog, way too many assumptions. The problem with my approach is that people can’t be easily categorized and the Bible is not one size fits all. This implies that we must minister to people in different ways depending on their spiritual condition. We can’t simply slap a verse on a person. We need to understand and sympathize with their spiritual condition before we can effectively minister to others. We need to be Bible doctors. If I’m going to truly help my friend I need to spend a lot of time listening, exploring, and understanding. I need to know some things before I can effectively “prescribe” the Bible. Does he need to admonished out of his unbelief? There are scriptures for that. Does he need to be encouraged in the midst of his faintheartedness? There are different scriptures for that. Does he need to be helped in his weakness. There are different scriptures for that. I would be an idiot to prescribe Pepto Bismol for a migraine headache, yet so often we “prescribe” scriptures without fully listening and understanding. By God’s grace, I want to grow in being a better Bible doctor. I want to learn from the Great Physician. Too often I’m quick to speak and slow to listen, quick to dispense and slow to diagnose. I need to stop being a Bible pharmacist and start being a Bible doctor. Author Nassim Taleb’s bestselling book, Antifragile: Things That Gain from Disorder, teaches a fundamental lesson. Life is about making oneself antifragile to the random and chaotic events that characterize human existence. In simple terms, a person’s life is characterized by fragility if unforeseen, random events cause exponentially more harm to the individual, the stronger the event is. Fragility is nonlinear in a negative direction. For example, if a person was faced with a minor financial setback (a loss of $1000), he may respond negatively to that setback, but not suffer a complete breakdown. If, however, that same person lost all of his wealth at one time, and he did have a complete breakdown, went into a deep depression, maybe became suicidal, then that person is fragile to wealth. The fragile person, when hit with a disaster, implodes. In opposition to fragility is antifragility. A person’s life is characterized by antifragility if unforeseen, random events cause exponentially more benefit to the individual, the stronger the event is. Antifragility is nonlinear in a positive direction. For example, if a person was faced with a minor financial setback (a loss of $1000), he may respond mildly negatively to that setback, just as the fragile person. If, however, that same person (who is antifragile) lost all of his wealth at one time, he would respond quite differently than the fragile person. Rather than spiral into self-pity and depression, the antifragile person would benefit greatly from the pain caused by this loss. Although the Bible doesn’t use the word “antifragile,” this concept can be found in many places. In his letter to the Philipians the apostle Paul rejoices that because of his “chains, most of the brothers and sisters have become confident in the Lord and dare all the more to proclaim the gospel without fear.” Paul sees that his suffering is good for him and those around him. Paul adds that “to live is Christ and to die is gain.” In this classic verse, Paul teaches that even death will bring him great benefit, not loss. In Romans 8, Paul reassures believers who are suffering that “in all things God works for the good of those who love him, who have been called according to his purpose.” In other words, every time time something bad happens to the Christian, God makes it work ultimately in her favor. James counsels, “Consider it pure joy, my brothers and sisters, whenever you face trials of many kinds, because you know that the testing of your faith produces perseverance. Let perseverance finish its work so that you may be mature and complete, not lacking anything.” Trials bring great benefits to the believer. The follower of Jesus, then, is truly antifragile. Whatever life throws at us, we are guaranteed to benefit from it, if not in this life, then the next. In fact, it seems that the more severe our tests here, the more potential for rewards – nonlinear in a positive direction. Not so for those who don’t know Christ. For the unbeliever, for the person who has no hope in Christ, his life is ultimately fragile. When things go wrong, there is no benefit, only meaningless pain and suffering. The fragile life is characterized by pain avoidance at any cost. Death is the end and there is no possible benefit from it. The fragile nonbeliever hangs on for dear life, literally, with only the abyss ahead of him. Too often we complicate the gospel. We widdle it down to a list of dos and do nots and forget that God looks at our heart first and foremost. We are called to obedience but He is merciful when we mess up. He loves us with an everlasting love and gave us Jesus as our advocate who continually intercedes on our behalf. As we yield to Him and follow His Word we can’t help but fall more and more in love with Him. As our love for Him grows, so grows our love for others. The following scriptures are such a wonderful summary of how we are to live our lives in Christ. My prayer is that the Lord will cement these words into our hearts so that we may walk out our purpose here the way He wants us to. The way He walked His out. Without murmurings and bitterness but with a servant’s heart. 1 Peter 4 NIV 4 Therefore, since Christ suffered in his body, arm yourselves also with the same attitude, because whoever suffers in the body is done with sin.2 As a result, they do not live the rest of their earthly lives for evil human desires, but rather for the will of God. 3 For you have spent enough time in the past doing what pagans choose to do—living in debauchery, lust, drunkenness, orgies, carousing and detestable idolatry. 4 They are surprised that you do not join them in their reckless, wild living, and they heap abuse on you. 5 But they will have to give account to him who is ready to judge the living and the dead. 6 For this is the reason the gospel was preached even to those who are now dead, so that they might be judged according to human standards in regard to the body, but live according to God in regard to the spirit. 12 Dear friends, do not be surprised at the fiery ordeal that has come on you to test you, as though something strange were happening to you. 13 But rejoice inasmuch as you participate in the sufferings of Christ, so that you may be overjoyed when his glory is revealed. 14 If you are insulted because of the name of Christ, you are blessed, for the Spirit of glory and of God rests on you. 15 If you suffer, it should not be as a murderer or thief or any other kind of criminal, or even as a meddler. 16 However, if you suffer as a Christian, do not be ashamed, but praise God that you bear that name. 17 For it is time for judgment to begin with God’s household; and if it begins with us, what will the outcome be for those who do not obey the gospel of God? 18 And, “If it is hard for the righteous to be saved, what will become of the ungodly and the sinner?”19 So then, those who suffer according to God’s will should commit themselves to their faithful Creator and continue to do good. Lord hide these words in each of our hearts that we would not sin against them. Give us a deeper love for you and each other. Remind us when we need it, that our time here on earth is short but that all we do here has lasting results in eternity. 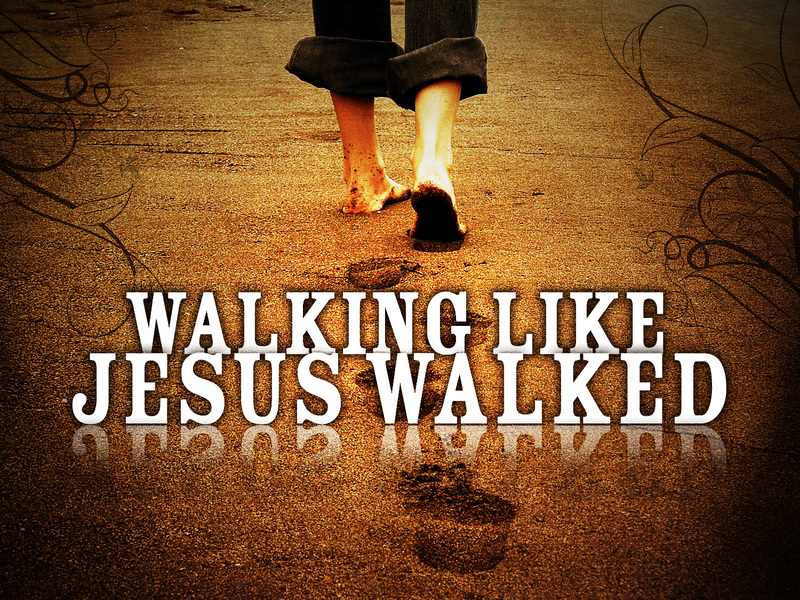 Jesus, help us to walk as you walked. In your precious name, Amen. You have been speaking about William Carey. When I am gone, say nothing about William Carey — speak only about William Carey’s Saviour. Paul calls Timothy his true son in the faith [1 Tim 1:2], and in his first letter to Timothy, Paul largely instructs and encourages the younger man. At this point Paul is probably rather old already, with plenty of experience in terms of the Christian life, church-planting and teaching, whereas Timothy was likely a young leader, with little experience in leading and building a church. Yet he had spent much time with Paul, and Paul’s high regard for Timothy was obvious through hints here and there in his other epistles, but most evidently from declarations of love and concern in his two letters to the young man. In 1 Timothy chapter 5, Paul advises Timothy on how to handle the widows, elders and slaves in the church – perhaps because these were three groups of people that were harder to deal with than the rest. Widows because of their need, elders because of their leadership position, and slaves because of their status. In this study, we will be looking at the phrase ‘laying on of hands’ and look at the responsibility that one will bear when making another person a leader. Do not be hasty in the laying on of hands – In English the phrase ‘lay hands on’ generally means to get a hold of something, and more often than not carries a negative connotation with it. But the Biblical use of this phrase is often to used to refer to ordination, ie. to accept somebody into ministry or clergy. There are two other instances in his letters to Timothy that Paul used this phrase – Do not neglect your gift, which was given you through prophecy when the body of elders laid their hands on you [1 Tim 4:14] and For this reason I remind you to fan into flame the gift of God, which is in you through the laying on of my hands [2 Tim 1:6]. In the immediate context of this verse we see Paul spending some time advising on the conduct of elders, which adds up to a list of high expectations of their life and conduct. The verse prior to this – I charge you, in the sight of God and Christ Jesus and the elect angels, to keep these instructions without partiality, and to do nothing out of favoritism – calls for impartiality even when judging the most influential of elders, and therefore it is natural to think that in this verse, which comes immediately after that, Paul advises caution in ordaining any man to be an elder. do not share in the sins of others – I’m sure this can be applied in a variety of different scenarios – in fact, in all the actions of others that goes against the word of God. However, putting this into the context of the elders, and of ordaining someone, then this sheds a harsh light onto the act of ordaining – we see now the responsibility of making someone a servant of God or a spiritual leader is a task with huge responsibility. And with good reasons, perhaps, for any elder that had been ill-chosen will perhaps be easily pulling the congregation down with him. There is no meaning in admitting anybody into the ministry of God hastily. Instead, let that person first be proved that he is worthy of double honor [1 Tim 5:17]. I suppose that also means that he should be righteous and be adequate in teaching his family, be full of grace and full of faith, be proven in his character. What does it mean to share in the sins of others in this case? Even if you weren’t the one nominating the elder or suggesting the option or making the decision, if you do not restrain or reprove of a person not proven, then you are sharing in the sins of those who are making the decision. Keep yourself pure – No man can truly keep himself from sin; as only Christ is able to keep them from falling. Not from one’s own sins – not in this context at least, but the sin of nature and actual iniquities. Keep ourselves pure from the sins of others, by not rashly and hastily admitting any into the ministry. In this case Paul’s advice to Timothy would be to remain pure by not taking a part in the sins of others through the observance of a strict discipline in the house of God. Some refer this to chastity of body, in opposition to the sin of uncleanliness, which Timothy’s youthfulness would mean that there are many more temptations that he would be exposed to in this regard. These would be very damaging to a person of his position. It is thus even more so important that he, as a young minister, should keep himself pure. Don’t let anyone look down on you because you are young, but set an example for the believers in speech, in life, in love, in faith and in purity [1 Tim 4:12|Article]. Most people probably do not really lay hands on another person anymore when they make them an elder. Maybe your denomination still do, I believe most ordained ministers still go through something similar. But can you imagine a hasty ‘laying on of hands’? Grab somebody, lay your hands on him, and he’s an elder. I don’t quite think that happens either. I’m not in a position in church in which I have any say over who gets to be what, for I’m a youngster barely out of school, but in my Presbyterian context we still do have to vote, and I believe this applies as well. If you are an elder, you have huge – but not impossible – boots to fail. It is because of the trust others have in you that they are willing to take on the responsibility of sharing your sins if you fail in your capacity. 1 Tim 3:1-13 is a renowned benchmark of what conducts the elders and deacons should be associated with. Regardless of our roles in Church, let’s try our best to stay pure.